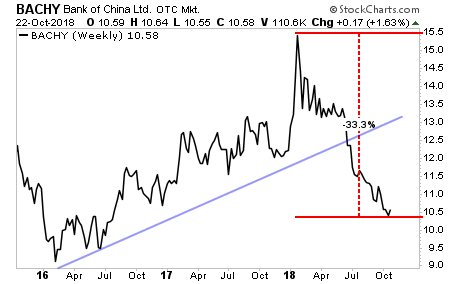 With that in mind, take a look at the chart for China’s banking sector. 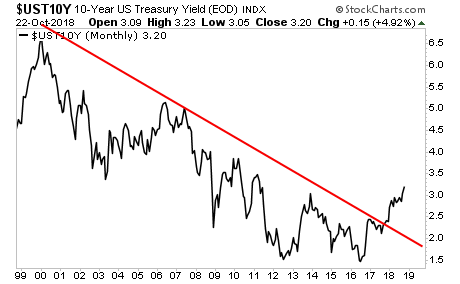 Not only is the bull market trendline broken, (blue line) but the chart has crashed an incredible 33%. 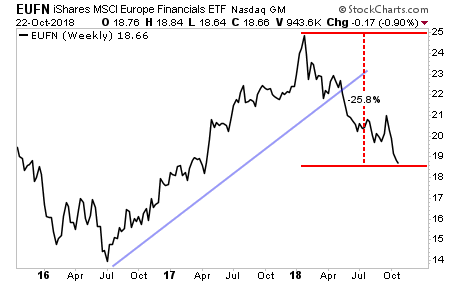 We are well into a full-blown bear market/crisis here. The ECB, working with the EU, managed to pull off a “Hail Mary” since 2015 by effectively buying everything via a gargantuan QE program. However, since the start of 2018, the very same problems (too much debt + political instability) have once again reared their heads, this time in Italy, a country with over $2 TRILLION in debt outstanding… a country/ financial system FAR too big to bail out.